Operation Black Vote has organised a free event to encourage more members of the Somali community to consider becoming magistrates. OBV and the MoJ, this year, celebrated the appointment of over sixty magistrates to courts across the UK . All the magistrates were encouraged to apply as a result of taking part in the Magistrates Shadowing Scheme. The scheme is a joint partnership of OBV and the MoJ, it raises awareness among local communities about the work of the courts and the role of magistrates; and encourages people from minority ethnic communities to consider applying to become a magistrate (Justice of the Peace). But OBV and the MoJ recognise that there are still community groups that are underrepresented within the court system. Areas where there are significant numbers of Somali locals would especially benefit from having members of their community reflected among magistrates on the court’s benches. 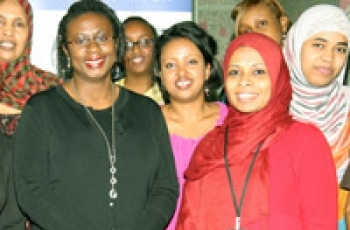 There are an estimated 93,000 Somalis in the UK with the majority residing in the South East. The seminar presents the opportunity for the Somali community to gather information about taking up influential positions in society, and consider making an important contribution within a public institution – the Criminal Justice System. “We had over 18 people stand as councillors in the last elections, some were successful others were not. But the important thing is that they stepped up as responsible citizens to help make a difference to our political and economic future. The free one-day seminar ‘A Judiciary for All’, will be led by magistrates and court officials. Those who attend will have the opportunity to deliberate sample cases and discuss the application process. The seminar presentations will explain what is required of individuals who wish to apply to become a magistrate including the time commitment and good character. The seminar will fully arm everyone with enough information to make an informed decision about whether or not they should pursue a position as a magistrate. The free one-day seminar will be held on Wednesday 20th October 2010. Picture: Merlene Carrington JP (left) & Somali Family Support Group members. For further information please contact Merlene Carrington by telephone on 0208 983 5430 or email: mag@obv.org.uk quoting ‘Regional Seminars’ in the subject field.